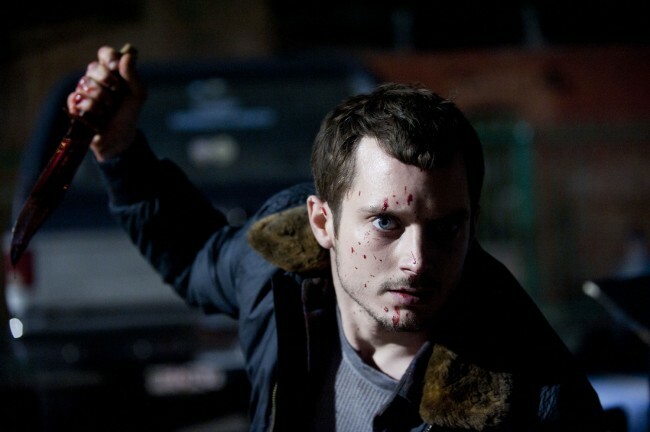 A windmill of knives and an assortment blood specked sheets, curled up like a python, is probably not what you would think of when someone mentions the mousy, cue ball eyed Elijah Wood. Franck Khalfoun’s fleshy remake of the 1980 slasher, Maniac, is a macabre, cuticle-snapping foray into the twisted psyche of a sociopath with serious mother issues. Boldly revisited in a first-person narrative, Khalfoun relies on a myriad of camera tricks to put you inside the tenderized mind of Frank Zito (Wood). We not only hear him wheeze with exhaustion, garble in pain, and cackle in depraved lunacy, we see, literally, through his eyes for the duration of the serpentine film. The last time this sort of first-person experiment was used in any capacity, to my knowledge, was 2009’s Enter the Void, in which Gaspar Noe sheathed us in the skin of a junkie in Tokyo. There, Noe held us in a state of over stimulation, an abacus of colors and baying sounds. In Maniac, Khalfoun uses a less surreal approach and instead subjects us to stark, unrelenting images of gore and anxiety. Zito’s character is a cat’s cradle of marred emotions and teeth gnashing impulsivity. And the fact that he collects mannequins, for purposes largely creepier than you may think, makes the film, and the antihero himself, gamy and vicious. The slideshow of horror in Khalfoun’s opus is marbled with more guts than a hyena would want, but that’s not to say that it isn’t a successful exploration of the POV narrative. Maniac is a strange, pulpy film that tests your endurance, perhaps, but it’s also masterfully suspenseful and eerily engaging. A marginal part of this, one would expect, is because of Alexandre Aja’s wilted, wildly ruthless screenplay. The author and director of 2003’s High Tension has seen some high – mostly low – points in his career, but with Maniac his lamp seems to have more oil left in it than it initially seemed. Elijah Wood’s slight body type and perpetually furrowed brow would, from afar, seem to debilitate the proceedings, but he actually orchestrates enough believable idiosyncratic behavior to merit the authenticity of a serial killer (yay for him?). Wood’s meek, trembling voice seems so uncertain it practically mirrors a loose floorboard someone could put their foot through. And while casting a Herculean actor with a contorted visage could have been more menacing, there is something scarier about the dude next door. Maniac is a much needed film in an otherwise anemic catalog of recent horror flicks. Slashers are typically daft, and maybe this one is to a certain extent, but there are so many interesting things going on that it’s hard to refute its importance to a genre that is in desperate need of a jumpstart. With so many fledgling PG-13 horror films out there, it’s nice to see a director brand a hard R onto his film, while also using the rating intelligently. Maniac is opening on July 5th and 6th at San Diego’s very own Digital Gym Cinema, curated by The Film Geeks. Tickets are available here.